• Fixed Frequency RC Oscillators. • Variable Frequency RC Oscillators. Section 3.1 The RC Phase Shift Oscillator. • RC Phase Shift Oscillator Using a Bipolar Transistor. • Buffered Phase Shift Oscillator. • Building a Phase Shift Oscillator. • Phase Shift Oscillator Tests & Measurements. • Operation of the Wien Bridge Circuit. • The Variable Frequency Wien Bridge. • Development of the Wien Bridge Oscillator. • Lamp Stabilised Wien Bridge Oscillator. • Diode Stabilised Wien Bridge Oscillator. • Wien Bridge Oscillator With AGC. 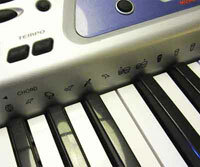 Single Frequency Oscillators that produce a sine wave output at audio within the frequency audio band have many uses. Audio oscillators are also used to produce sounds such as the simple warning beeps in anything from automobiles to airliners. Oscillators may produce a single sine wave with a carefully controlled frequency, or may output a range of frequencies by having multiple frequency controlling elements, such as RC filters, selected by a series of switches or keys, and have their waveshape manipulated by extra circuitry for use in such systems as electronic keyboards. Audio oscillators produce waves having frequencies from about 20Hz to 20kHz (the audio spectrum) and up to about 100kHz for ultrasonic purposes. Variable frequency oscillators are used in audio signal generators that are essential for testing amplifiers and fault tracing in many electronics systems. The RC oscillators used for these applications can be capable of producing signals up to around 1MHz or more. Although there is some crossover of the frequencies that can be produced by high frequency RC and low frequency LC oscillators, at frequencies below about 100kHz it becomes less practical to use LC tuned circuits, because the physical size of inductors and capacitors required for resonance at these frequencies becomes too large. 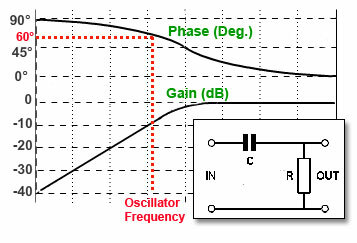 Lower (audio) frequency oscillators therefore use various designs of RC filter circuits to produce the necessary phase shifts in the feedback path from the output to input of the amplifier section of these oscillators.